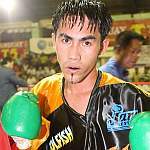 POLOMOLOK, South Cotabato – Jether Oliva bucked a freak knockdown in the third round to outlast tough Thai opponent Paithong Muangsima over ten rounds Thursday and kept his immaculate record clean. Oliva was pressing the awkward but rock solid southpaw Muangsima in the third canto when a left hook caught him behind the ear, nearly dropping him to his pants, his gloves touching the canvass. Although he didn’t look seriously hurt, the referee gave Oliva the mandatory eight count. Jether later told reporters he still hasn’t found his rhythm after a long layoff on account of an injured right hand in his fight last March. Muangsima said, through his trainer, he believed he won the fight. But former WBO super flyweight champion Gerry Peñalosa said Oliva clearly won the fight. “He was the more aggressive fighter and connected the more telling punches,” Peñalosa said. The 21-year old former amateur standout peppered the game Thai with body shots and powerful headshots but the crowd-pleasing Muangsima refused to buckle. Jether won on all judges’ cards by wide margin. Oliva improved his record to 15-0 with 10 knockouts. The Thai suffered his fourth loss against nine wins. Oliva’s manager JC Boy Manangquil said his ward will vie for the World Boxing Federation Asia Pacific flyweight crown later in the month. Aside from the main event, only two other fights in the 11-bout card went the distance. In the main undercard, bantamweight Ray Las Piñas knocked out Arnold Montojo in the second round to follow up his sixth round technical decision win over the same opponent in Dipolog City last July. Veteran journeyman Michael Rodriguez spoiled the undefeated record of Ricardo Claveria with a masterful majority decision win over his younger opponent. Bantamweight Fernando Lumacad bounced back from a humiliating knockout loss in the hands of Mexican Jorge Arce with a third round technical knockout win over late substitute Rodel Veronque. Lumacad, a former protégé of Maasim mayor Jojo Lopez, sent Veronque to the canvass in the first and third rounds before the referee halted the fight. Other results include a second round knockout win by Randy Petalcurin over Winnie Bartiquil. Jeffry Jimenes knocked out Janjan Gello-ani in the third round to register the night’s major upset. Roberto Udtuhan won via 4th round stoppage over Petras Abad while Erwin Ancajas knocked out Sherwin Lungay in the first canto. Froilan Saludar stopped Ramie Gaabon in the first round while Restremos also knocked out Roland Palac. Ardel Romasasa won by unanimous decision over four rounds against Jay Alolod.